When I created this little art quilt, I used a lovely piece of vintage fabric that I had discovered among my mother's sewing scraps. I cut through the fabric to release a wing as I loved the idea of a butterfly breaking loose from the fabric of its life....and flying out and freely through an opening window in time. I never dreamed that the butterfly imagery would not only represent freedom from the absolute chaos, despair and grief that arises in family members and survivors of Alzheimer's Disease, but the huge grief that overwhelmed me when I received the news that my father had just died. When I realized that this little art quilt had been officially registered by the Alzheimer's Art Quilt Initiative on August 18th...the very day that my father had passed away, and that I would in my overwhelming grief and disbelief that followed, actually think to pack it, and another small quilt in my luggage, as I raced to Alaska within a 24 hour period to be with my mother. I'd made the quilt in love and memory of my mother's battle with advanced Alzheimer's but found myself amazed at how both of the art quilts I'd just made, so thematically synchronized with my father's passing. "The Butterfly Upon the Sky" was inspired by poet Emily Dickinson as she calls upon us to emulate the beauty and the grace of the butterfly and to "soar away and never sigh, And that's the way to grieve." I had thought it meant all of our losses from Alzheimer's Disease, the 'great thief' that robs its victims of their very selves, and us of our loved ones. But instead, it also represented this sharp, additional pain...this grief in the loss of my beloved father. As I had created this art quilt, I had allowed its calming gentleness to enter and to soften my heart, and as I mailed it from my island home in Alaska, on the very day that my father's ashes came home to rest, I sought to create and manifest a moment of that same peace, knowing that my 93 year old father had, indeed, broken free and was now allowed to soar forth and manifest into creation...a new form in spirit in eternal space and time. So, today, as we take a moment of silence to honor and respect all those who lost their lives today, nine years ago on September 11th, I also take a moment to feel honor and respect for all those lives once led in one form and now... like my little butterfly upon the sky.... to soar in hearts and memory once more....for those who grieve, those who care, and all those who now fly freely. Elaine, the butterfly quilted piece is awesome! Your story is amazing. Sad day today, just thinking of 9/11 and all those who were lost. Michele...I think you have been called Elaine before btw (still smiling)I love all and everything about this. You make me smile, you make me laugh, and you make me cry. What a perfect personal post for today. Awesome and meaningful. Thank you for this. Tonight was the Last Night of the Proms in the UK. A very emotional evening, even for those of us watching it from afar. What made it even more emotional was the fact that it's the anniversary of 9/11. BTW if you like Neil Sedaka you would have loved it! Big hugs, as always my friend. 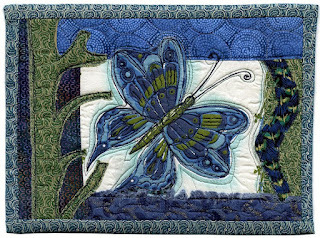 Very beautiful quilt Michele. Again I am so sorry on the loss of your father. Very striking. You are just such an inspiration to me how you keep going no matter what! Such a moving post- eloquent and poignant in expression. I love the butterfly quilt- I am sure it is even more beautiful when seen in real life. Friday was the anniversary of my grandmother's passing- Somehow thinking of her as free is comforting- though she was not ill when she passed. Sending you warm thoughts of comfort. I posted yesterday and there is a link to your beautiful post- Hope you have a bright and beautiful day..